If you’ve taken antacids for heartburn, gas or bloating then you may be setting yourself up for serious health problems. The FDA recently warned that antacids were never meant to be used as a long-term solution for heartburn. 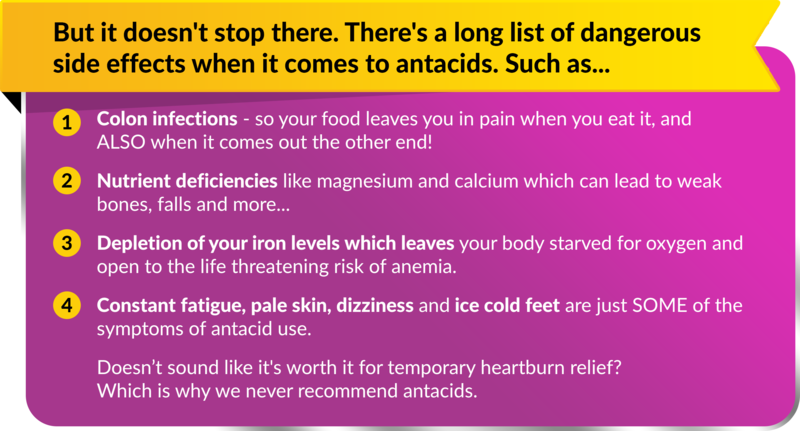 In fact, the FDA reports that antacids should NOT be taken for longer than 2 weeks. Yet, most people pop antacids like Tic Tacs for 20 or 30 years! A few months ago, the FDA stunned many seniors when they revealed that antacids can cause serious internal bleeding and ulcers. And a review they did last year showed that antacids could be doing irreversible damage to your bones. So, what do we recommend instead? An approach that actually repairs, balances and strengthens your entire system. Unlike antacids that eliminate the acid in your stomach, we need to balance the acid in your stomach. Because if you totally eliminate stomach acid, you can’t digest your food properly. And when you can’t digest food properly, you’re setting yourself up for serious health problems like being sick all the time, brain fog, weak bones and long bouts of fatigue. Which is why it’s important to balance the acid in your stomach. Not too much, not too little. That is why the approach needs to have a solution that gets rid of the occasional heartburn, bloating and gas without the dangerous side effects. What is needed is a powerful formula that repairs, balances and strengthens your entire digestive system so that it works the way it should! Remember when you were younger, and you could scarf down a cheeseburger and milkshake without thinking twice about it? Well that’s because your stomach was strong and balanced back then. But over time your stomach weakens due to aging and too much processed food. You need a remedy that helps strengthen your stomach so that it works like it did when you were younger. If you are suffering from gas, bloating, occasional heartburn, diarrhea, constipation – or God forbid all of these things, then please do yourself a favor and schedule a complimentary consultation with one our Functional Health Practitioners. They have the special expertise to custom design a program tailored to your needs, without the use of drugs and medication.